This is a fantastic deal to grab on Amazon. 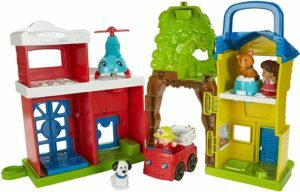 You can grab the Fisher-Price Little People Animal Rescue Playset for only $25.59! That is a savings of 36% because this playset is normally $39.99! Make sure that you grab this deal soon because the prices can change at anytime on Amazon! CLICK HERE TO ORDER the Fisher-Price Little People Animal Rescue Playset for only $25.59 today!